Homeowner’s Associations… some instantly cringe at the thought of hearing those two words. With over 69 million Americans living in common interest communities, many homeowners don’t really understand how they work and what they can do to make their community better. A homeowner’s association (HOA) is an organization in a subdivision, planned community, or condominium that makes and enforces rules for the properties within it’s jurisdiction. Those who purchase property within an HOA jurisdiction automatically become members and are required to pay dues, known as HOA fees. Most associations have a set of laws/rules in which the community is expected to abide by. Some associations are lenient, while others can be quite restrictive. If you’re shopping for a new house, you will likely come across properties that are part of an HOA. HOA’s assess fees that help maintain common areas and cover community services. Knowing the fees and services up front may help you decide if you want to live in the community or weather you can afford to. It’s also important to understand the HOA rules that you need to follow if you purchase a home within an HOA. Association regulations are designed to protect property values. Rules and regulations are enforced to prevent property neglect that result in neighborhood decline. Take time to read over the HOA covenants and bylaws to understand any restrictions that may be an issue for you. Make sure the home you want to buy is not already out of compliance with the HOA rules. 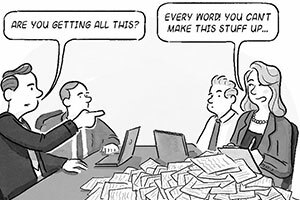 Buying into an existing problem can be a huge headache. Are you the type of person who hates being told what to do? If so, living in a community with an HOA may be a frustrating experience for you. A benefit to homeownership is the ability to customize and alter your property to fit your need, but HOA rules could interfere with this. An HOA could enforce paint colors, roof types, yard restrictions, fence specifications, etc. Be sure you are comfortable with everything before you make the huge decision of purchasing a home. How much are the annual fees? Are there ever increases? If so, how often do they occur? Do the covenants/bylaws have a restriction on how much they can be raised each year? Is the HOA financially stable? How much do they have in a reserve account for unexpected expenses? Find out if the HOA has done any special assessments in the past. Confirm what the association dues cover. The Board of Directors is made up of a group of volunteer homeowners wanting to be involved in the community. An election takes place at the Annual Meeting where owners vote on a number of members to serve on the Board. The Board of Directors is elected to enforce and oversee the HOA governing documents. 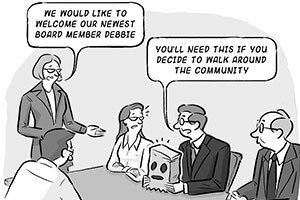 Effective board members maintain a professional attitude when it comes to HOA board responsibilities. They are also willing to see things from the perspective of others. The HOA’s governing documents generally “run with the land,” which means that all current and future owners of property within the HOA will be bound by them as a conditions of property ownership. The covenants, condition, and restrictions (CC&R) are the most important documents affecting the neighborhood and are created when the neighborhood is formed. The CC&R specify what types of structures can be placed on a lot. All homeowners are welcome to attend the Annual Meeting. It is an opportunity for the association to share previous year accomplishments, review the HOA financials, discuss upcoming projects and vote on board members. When an emergency or special project is necessary for the community, such as painting the exterior of all the buildings, an additional fee may be required if the HOA does not have enough reserve funds to cover the expense. Find out what insurance coverage the HOA has and have a clear understanding as a homeowner what coverage you need. For example, condo associations can be tricky on what the HOA covers vs. the homeowner. Make sure to ask a lot of questions so you can ensure you have accurate coverage. It is important for homeowners to educate themselves about the HOA, attend meetings and get involved. Homeowner participation brings fresh ideas and different perspectives to the table. 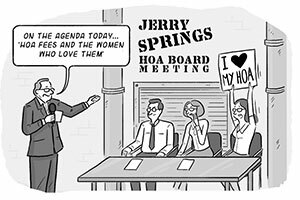 Getting involved in your HOA is important, but how you get involved can make all the difference. Owners have the power to bring about positive change. Positive change comes through understanding the HOA rules, attending the meetings, contributing ideas, time and skills to help the community. With good leadership and involved members, an HOA can become an asset to the community. Members who get involved, understand HOA issues and treat each other with respect and diplomacy. If you’re not satisfied with your HOA, step up and be the change! Relax, we’ll do it for you! As a management company rest easy knowing that we are the experts to handle your Association Management. PJ Morgan Real Estate manages over 80 Homeowner’s Associations. Click here for more information or give me a call. I’d be more than happy to answer any questions. We are good at what we do. We are #withyouforlife. Director of Residential Property Management and Realtor, Cara Woosley, is a woman who gets things done and tells it like it is - always with a smile. 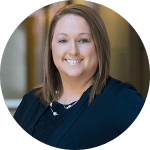 Cara’s upbeat attitude and sense of humor shine in her real estate roles and as a fun-loving wife and mom.